A DVD presentation of our most important message to discover the long-lost key to soul-winning. RON DICIANNI: "Ray Comfort forever changed my approach to sharing the gospel." TOM GRINNER, Gateway Broadcasting: "This is the hottest message on the planet!" PASTOR REB BRADLEY: "It will revolutionize the Church." PASTOR WAYNE WELBORN: "The best thing I have ever heard!" PASTOR KEN ARMSTRONG: "I began to weep as I saw the importance of this message." PASTOR JEROD MCPHERSON: "'Hell's Best Kept Secret' has completely destroyed my theology. What was first anger toward you caused me to search the Scripture, and has now turned to a sincere thank-you." SCOTT WILSON, KY: "Today I listened to 'Hell's Best Kept Secret' for the first time. It changed the way I look at everything. I was blind to it until today." 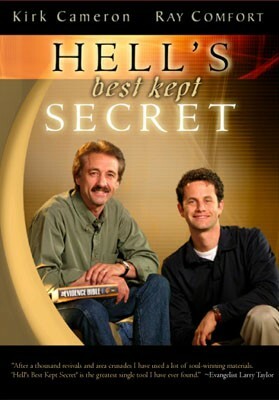 PASTOR CHRIS STOCKWELL: "I listened to [the audio of] 'Hell's Best Kept Secret' 250 times!" TOM ELLIFF, Past-president of the Southern Baptist Convention: "'Hell's Best Kept Secret' is a message every congregation needs to hear." EVANGELIST LARRY TAYLOR: "After a thousand revivals and area crusades, I have used a lot of soul-winning materials. 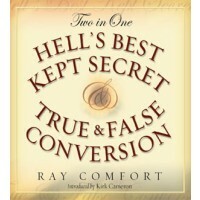 "Hell's Best Kept Secret" is the greatest single tool I have ever found."